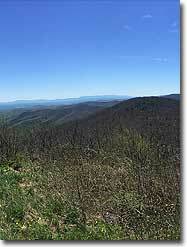 Reddish Knob, located on the Virginia/West Virginia state line west of Harrisonburg, is a popular local spot with spectacular vistas. But few people hike it for two reasons: (1) it is a really long hike, and (2) why hike there when a paved road takes you to the top? The answer is that if you can make this hike, you can do just about anything in Virginia. It is an incredible workout! This hike is not rated for camping. Not because there are no campsites, but because the Forest Service trailhead parking lot prohibits overnight parking. If you wish to make this a backpack, you should look to the nearby Sand Spring Mountain hike, which can connect up with this ascent. Mile 0.0 – The yellow blazed Wolf Ridge Trail starts next to a large kiosk located on the edge of the parking lot. The kiosk includes a topographic map of the area’s trails – take a cellphone photo if you forgot your Hiking Upward map, as recent changes to the trail make these the only two accurate accounts of the trail, as of this writing. This area has become a mountain biking mecca in recent years, and the mountain biking community has remade this trail using federal transportation funds. This was formerly a seldom hiked route, and is now a popular bike trail. The first couple of miles of trail are substantially different than what the trail map you may have purchased at the store tells you because a trail that used to go directly up the mountain now has multiple long switchbacks. Because of these improvements, the trail is nicely constructed with new trail signs. Be always on the lookout for bikers on the trail! Mile 0.7 – The trail takes a right at a point where the original trail continued to your left directly to Tillman Road. There is a trail sign here. Continue a short distance and complete your only stream crossing on this hike. Mile 0.9 – Pass a small overlook in the woods, which looks back on where you just hiked. It is a great spot for a break. Mile 2.2 – The trail passes through a nice little chute, with rock on either side, on a new section of trail. Mile 5.2 – The Wolf Ridge Trail meets the end of the Lynn Trail, which drops 2.2 miles down to a parking area off of the Briery Branch Road – the road to the summit of Reddish Knob. 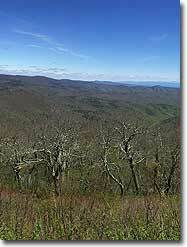 The Lynn Trail is an alternate way to hike to the Reddish Knob summit, cutting off a total of 6 miles of hiking. Mile 6.0 – After a steep climb, the trail levels out and passes a small wildlife pond, which in the spring might contain Salamander egg masses, as shown in the photo. Mile 6.1 – The Wolf Ridge Trail ends where it meets the Timber Ridge Trail. To the left the Timber Ridge Trail travels 0.7 miles to an intersection with the Sand Spring Trail, part of a loop described here. Either of these trails takes you back to Tillman Road. The new sign for the Wolf Ridge Trail here was gone, but there are also a couple of older signs at this intersection. Turn right here, and continue uphill, passing another wildlife pond on your right. 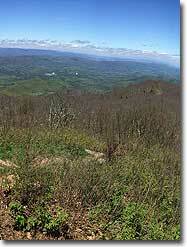 As you climb, look for evidence of utility poles that were used when Reddish Knob’s summit included a fire tower. Those poles have now been cut down, and the fire tower has been gone since around 1975. Mile 8.7 – Cross a rocky talus slope and get a nice view of the mountains to the south. 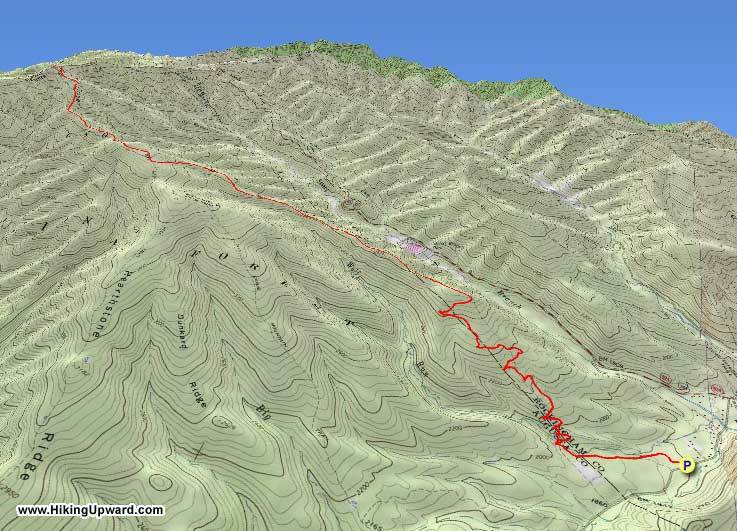 Mile 9.0 - The trail crosses the road to the Reddish Knob summit just before the prize. There is a small parking spot here if you wish to make this a shuttle hike. This is preferable to parking on the summit. Spring Trillium can be found after crossing the road. Mile 9.1 - The trail ends at the summit of Reddish Knob, which, at elevation 4,393 feet, is higher than anything in Shenandoah National Park. Among the many other things painted on the pavement here is a line showing the state boundary, indicating that you crossed into West Virginia just before the summit, and then crossed back into Virginia to gain the highest few feet. From here, you have 360 degree views into both Virginia and West Virginia. The pavement and guardrails are continually sprayed with graffiti, which is why you might be better off parking a little ways down the road from the summit. Mile 18.2 – If you did not shuttle, return to your car following the same path back. Upon your return, feel confident that you can conquer anything the Virginia mountains can throw at you! And then go soak your feet. Planned this as an overnight up and back trip. Contrary to the description the parking lot at the trailhead does allow overnight parking. Need to have your head on a swivel as you are heading up, as mountain bikers will be flying down and around corners. Almost no views on the way up, but the hike is a solid challenge. The view from Reddish Knob is one of the best I've seen in the state. I would rate this as a 1 for camping updating for the parking error. There is a semi sketchy (beer bottles, graffiti, lots of people) parking lot at the top, and on the evening I was there I encountered some of the most ferocious wind I've experienced. I needed to hike 3ish miles along a fire road to get to Bother Knob to camp, where the wind was only slightly better. If you want a challenge... go for it, but next time I'll drive up.